← Wolf Hunt Coming for Michigan? If last year was any indication of what the future holds, bow hunters can expect pretty good hunting when Michigan’s archery deer season opens tomorrow. The season runs until Nov. 14, then reopens Dec. 1 to Jan. 1. Last year’s bow kill was up 12 percent from 2010, according to state wildlife officials. Archers took 131,615 bucks and does. The number of bow hunters also increased by 5 percent. State records show 321,869 archers participated in the 10-week season. 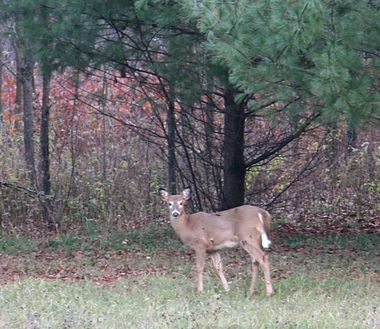 “The biggest increase took place in the northern Lower Peninsula,” said Brent Rudolph, the Michigan Department of Natural Resources deer specialist. “Hunters took 33 percent more does and 34 percent more bucks, 34 percent overall. Rudolph. Three consecutive mild winters helped. Deer survival improved. There now are more hunters out during the season as well. That change, he said, coincides with “the liberalized allowance of crossbows during archery season.” Interest in muzzle-loading season also has climbed. Michigan legalized the use of crossbows during the archery three years ago. Their use was limited to the firearm season prior to that. Rudolph said he is developing a survey to send to crossbow hunters about their success hunting deer. That three-year survey was promised when crossbow use was legalized for the archery season. Critics were worried allowing crossbow use might shift too much of the deer kill from the firearm season to the archery season. They feared the archery season might be shortened as a result. “Things have cooled down some, but we still have concerns that they (the DNR) will find that too many bucks are taken before the rut,” said Bruce Levey, former president for the Michigan Bowhunters Association. Levey plans to be out hunting opening day. “You have to go out. There are rules,” he said jokingly. October. He and friends have a Missaukee County deer camp where they hunt for two to three weeks each season. Monday’s opener is the 75th anniversary of Michigan’s bow season, which began in 1937, Hall said. Getting that first season took some legislative doing. Archers, even then, were allowed only to hunt in Iosco and Newaygo counties and from Nov. 1 to Nov. 14. Back then, only bucks could be killed. The first deer of that season was shot by William VanVorst, of Lowell. Only three deer were taken throughout the entire season, Hall said. That’s a far cry from what archers accomplish during the season these days. Upper Peninsula wildlife biologists say hunting there should be decent this season. The 2011 U.P. buck harvest was up 20.3 percent, and the antlerless harvest was up 16.9 percent over 2010. Southern Michigan, however, might be the big surprise. After years of surging deer populations, those numbers are leveling off. Archers shot 79,533 deer in the southern part of the state during the 2011 season. They are expected to do as well again, though some areas will have fewer deer because more than 2,000 have been reported as having died from epizootic hemorrhagic disease, which is transported by tiny, biting midges. This entry was posted in Uncategorized and tagged Bowhunting, Crossbows, Deer, DNR, Hunting, Michigan Bowhunters Association. Bookmark the permalink.